Standing before his pails of tints and toner, Phil Hoffman addresses 10 or 12 participants of his hand-processing weekend at Double Negative Darkroom in Hackney, London (Professional Practice: LUX Film Farm, June 20 and 21, 2015). He mentions the kind of footage rejected by commercial processing labs, and in passing mimics the technician who would apply directly to the celluloid the decision to reject – “with two exclamation marks,” Hoffman adds. To restore such images almost treats them as a social class, as sequences existing on the margins of a particular visual regime that includes a good deal of industrial work, images in exile. But these are “images” only in the sense that Bergson gives to the word in Matter and Memory. That is to say, for Bergson images have an ontological status independent of whether anyone ever sees them. They resemble more closely our concept of a material object. 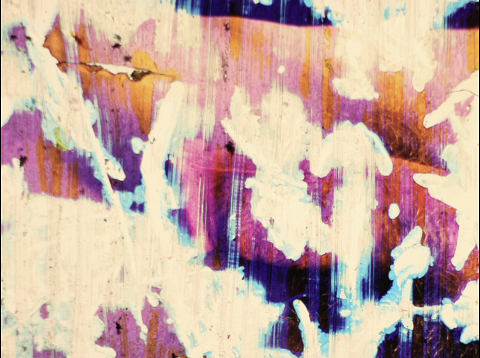 Her Silent Seaming (super 16 image-sound, 10.5 min., 2014) by Nazli Dinçel, still. Deleuze cites Artaud’s experience of thought and suggests a relationship between this experience and cinema’s break with the sensory-motor image. “The sensory-motor break makes man a seer who finds himself struck by something intolerable in the world, and confronted by something unthinkable in thought.” (Cinema 2, The Athlone Press, 1985, p. 169) But when Deleuze writes that cinema has a special relation to belief, when he identifies its Catholicism, we must not think of such belief in terms of film theory. Metz had articulated the cinema’s power in relation to theater and photography, accounting for its appeal by virtue of its capacity for illusion. But it is not this meaning of illusion that bears on belief for Deleuze. Dreyer, Bresson, and Rossellini exemplify cinema’s piety, and restoring such belief belongs to cinema’s essence. Today its Catholicism finds expression in the experimental films of Eve Heller and David Gatten (Behind this Soft Eclipse and Hardwood Process, respectively, screened by Phil Hoffman as part of the Film Farm’s 20th Anniversary Show, held at LUX London, June 18, 2015). There are two directions for belief. To the first, which includes Heller and Gatten, we can add the dual-projector show of French artists Carole Thibaud and Mariane Moula for a program organized by Lichun Tseng at Rotterdam’s De Player (Celluloid and Light: Expanded cinema performances, June 6, 2015). On screen the frames looked punctured in the simplest manner, the sound apparently a result of the puncturing act that went into the creation of these “images.” If John Cage’s 1952 score, Williams Mix, could be projected for the sound produced, we might have such a film. Created by cutting up and pasting strips of 1/4 inch audio tape onto paper, Cage’s work is, strictly speaking, just a score. A performer would read it. But what would film be like if handled as audio tape in this manner, scored in strips and played back on a projector? At one point in the show we were left in the dark to listen to the rhythm produced by the artists’ use of the optical soundtrack. To speak of such a use is, of course, to gesture toward an abuse. If Deleuze’s notion of the “spiritual automaton” no longer applies in a digital world, it remains productive for thinking about the Rotterdam show, as well as Nazli Dinçel’s Her Silent Seaming (Experiments in Cinema, Albuquerque, NM, April 15 – 19, 2015, and Chicago Underground Film Festival, Chicago, IL, May 13 – 17, 2015). I will explain. Proceeding from Godard and in terms of discourse, Deleuze identifies a second direction for belief. Belief can be Christian, revolutionary, or feminist. Deleuze discusses Godard at length, but a loss of belief would seem to be a loss of faith in discourse. Belief is now lost when language is conceived as writing in the sense Kenneth Goldsmith gives it, writing as code or separated from meaning altogether, at least such meaning as it is generally understood with respect to language. As an expression of belief, however, the cinema links image and sound, and as such synchronized speech is devout. In the Chicago screening of Her Silent Seaming physical blows were delivered directly at the audience, in much the way we see in Carole Thibaud and Mariane Moula, but this time a result of what has been captured on the strip itself, without live performance. A sudden bar of light appears repeatedly at the top of the screen followed by a loud chunk of noise, an artifact of the apparatus of projection for sync sound in film. The effect is that of inscribing imagery onto soundtrack and is, in its effect, something like the way thunder follows lightning. On the same program two works immediately followed Dinçel’s. In the first, the picture merely receives a musical accompaniment. It is in sync. An optical soundtrack results in music for an image. In the second a digital transfer and its digital projection for the festival remove any sense of film’s relation to sound. The work has a sound design. Only in Dinçel’s film can we still recognize belief’s undoing. After the film roll I shot has been screened to the small audience in London, mostly participants of the hand-processing weekend, I sit next to the projector and announce that I’d like to have seen it in positive. I am later reminded of this admission when I recall the opening shots of Heller’s Behind this Soft Eclipse, which I had seen several days earlier at LUX. I wouldn’t have said that Heller’s film begins in negative, although it does. Its image seems to precede the very distinction between positive and negative. Perhaps an attachment to positive in black-and-white film is like an attachment to lab work. Although there’s nothing inherently wrong with it, there remains a good deal that such an attachment suppresses. It affects our ability to see, and only a turn toward the material itself opens our eyes. Thibaud and Mariane Moula, still. Heller’s film had passed smoothly between negative and positive, often leaving it difficult to say which we were seeing, the positive or its reverse. At the screening that concluded the hand-processing weekend, while watching another student’s work, I suddenly realize that Phil had just remarked, in passing, on the appearance of positive pictures in it. We had made only negative over the weekend, and I was startled by my recognition of what Phil was referring to. He begins to explain the effect by reminding us of a process. We are to ask, how could an image have looked positive? But this was not my question. For me there was simply something about having witnessed false positives, particularly once I recalled the true positives of Heller’s work on the previous evening. Nazli Dinçel, Her Silent Seaming. 2014, super 16 image-sound, 10.5 min. Eve Heller, Behind this Soft Eclipse. 2005, 5 min., 16 mm, silent. David Gatten, Hardwood Process. 1997, 14 min., 16 mm, silent. 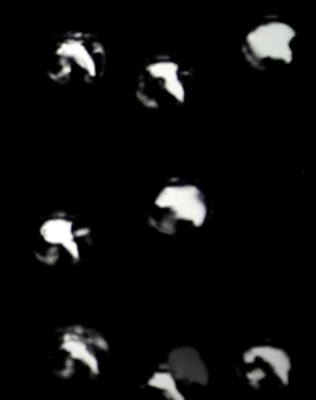 […] (16 mm, optical sound, live performance with projectors, duration variable, performances in 2013, 2014, and 2015) by Carole Thibaud and Mariane Moula.